Russian President Vladimir Putin speaks at the Kremlin, in Moscow, Russia, Dec. 26, 2018. It's been a mixed year for Russian President Vladimir Putin. Putin may look like a winner after an abrupt U.S. decision to pull out of Syria. But Russia's leader faces massive challenges in Syria and elsewhere, and he hasn't moved an inch closer toward throwing off the Western sanctions that have emaciated Russia's economy. The Russian military campaign in Syria has achieved the Kremlin objective of shoring up Syrian President Bashar Assad's rule at a relatively modest cost and made Moscow an essential player in the Middle East. However, Syria lies in ruins after nearly eight years of fighting and Moscow has failed to persuade the West to help foot Syria's multi-billion reconstruction bill. Even though the hasty pullout ordered by U.S. President Donald Trump could further bolster Moscow's clout in Syria, it leaves Russia pitted against Turkey, which is eager to expand its zone of influence. Moscow will also be saddled with the delicate task of trying to balance the conflicting interests of Israel and Iran in the region. "It could be seen by some as Putin's success, but in fact it means trouble for Putin," Alexei Malashenko, a leading Moscow-based Middle East expert, said about the planned U.S. withdrawal. "The situation may change drastically, and Russia will be responsible for that. Bickering with the Americans was better than being left face-to-face with Turkey, Iran and others." Trump's plan to halve the U.S. troops' presence in Afghanistan by the summer could spell more potential problems for Russia. Putin has mocked the U.S. failure to stabilize the country despite a 17-year campaign, but the reduction of the U.S. military presence in Afghanistan could foment dangerous instability by Islamic militants in Russia's underbelly of Central Asia. The U.S. and the European Union sanctions came in response to Russia's 2014 annexation of Crimea, its support for separatist rebels in eastern Ukraine, Moscow's meddling in the 2016 U.S. presidential election and the nerve-agent poisoning in March of a former Russian spy in Britain. The sanctions have restricted Russia's access to international capital markets, limited imports of Western energy and military technologies and spooked international investors. Yet while the Western restrictions have stymied Russia's growth, they also gave Putin a convenient explanation for his domestic problems. "The American and European sanctions have in fact helped bolster Putin's power, allowing him to point to foreign pressure," Malashenko said. Russia saw 1.5 percent growth in 2017 following a two-year recession and its economy is set to grow 1.8 percent this year. But the Russian government's hopes for faster growth haven't materialized and the nation has remained heavily dependent on exports of oil, gas and other raw materials. As revenues drained, the government raised the retirement age this year — an unpopular move that fueled broad discontent and significantly dented Putin's popularity. The Kremlin's hopes for striking a deal with Trump that would see an end to sanctions have faded amid the U.S. investigation into possible collusion between the Trump campaign and Russia. Putin has denied interference in both the U.S. 2016 election and meddling elsewhere in the West. While the Russian leader needs the sanctions lifted, he has made it clear that he wouldn't budge on Ukraine or any other issues. 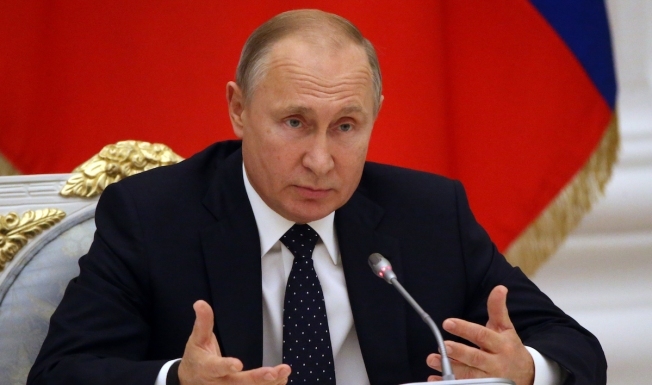 Tatiana Stanovaya, an independent political expert who writes extensively about the Kremlin, noted that Putin's uncompromising stance stems from his view that the West will see any concessions as a sign of weakness and make more demands. "Putin believes that if Russia gives in, the pressure will only grow and the sanctions will be expanded further," she said. Amid rising tensions with the West, the Kremlin has focused on beefing up Russia's military arsenals. Vladimir Frolov, a Moscow-based foreign policy expert, saw Putin's statements as part of his efforts to persuade the West to sit down for talks. "His goal is to win attention, fear and respect from the West, to get the right of veto regarding Western policies," Frolov said. "He's pushing for talks on Russia's conditions and without any unilateral concessions." Stanovaya noted that Putin's talk reflected growing instability in the absence of a common agenda between Russia and the West. "Moving further along the same track would inevitably lead to the point where it would become more difficult to control the situation regarding nuclear weapons," Stanovaya said. "Putin believes that nuclear weapons are Russia's ultimate argument that should influence Western politicians' thinking."